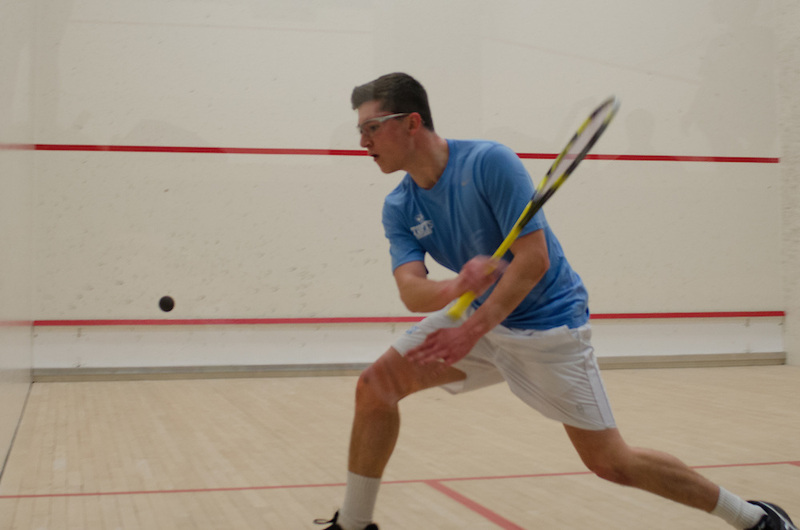 For the first time in almost 10 years, Tufts competed at the Summers Cup at the College Squash Association (CSA) Team Nationals at Yale beginning on Feb. 15. The Summers Cup division includes the No. 17 through No. 24 nationally ranked teams. Tufts entered the tournament as the eighth seed. Going into the weekend, the Jumbos were playing without their first position player, junior Raghav Kumar, due to injury, so the Jumbos all had to play up one position. Despite losing all three matches, the Tufts players competed at the highest level of squash they had seen in their careers and came out with a No. 24 national ranking, the program’s best since 2010. In its first match against No. 1 seed Williams, Tufts fell 9–0. Williams swept Tufts in seven out of the nine games, and the other two wins went to four and five games, respectively. In the five-game match at the second position, senior co-captain Alan Litman played back-and-forth with William’s sophomore Wyatt Khosrowshahi, but Khosrowshahi claimed the fifth game and the win (13–11, 8–11, 11–8, 9–11 and 11–9). In the four-game match, Tufts’ first-year Dillon O’Shea won his first game 11–9 before Williams’ first-year Jacob Bassil went off with three consecutive wins (11–8, 11–3, 12–10) to steal the match away from the young Jumbo. After losing to Williams, Tufts dropped to the consolation bracket and played Bates College in the semi-finals the following morning. No. 21 ranked Bates College had already defeated Tufts in the regular season and were quick to do it again. After losing to No. 20 MIT on Friday, the Bobcats came out strong against the Jumbos, beating them 9–0. Senior co-captain Brett Raskopf led 2–1 in the sixth position before Bates’ senior co-captain McLeod Abbott came back to win (11–4, 10–12, 9–11, 11–4, 11–5). Tufts’ first-year Marco Rodriguez got one win during the third game against the Bates’ Mahmoud Yousry, who then finished him off in the fourth. Similarly, senior co-captain Aidan Porges claimed one game out of four against Bates’ junior Benni McComish in the seventh match of the Jumbo-Bobcat battle. In their third round the following morning, Tufts traveled to the Chelsea Piers Connecticut complex to compete against Bowdoin for seventh place and to determine who would claim the No. 23 national CSA ranking. Despite many close contests, the Jumbos lost 6–3 to the Polar Bears Sunday morning. Of the nine matches, three went in five games, four in four games, and two in three games. Bowdoin was able to pull ahead 5–1 early on to claim the win, but Tufts fought back out of pride. In the ninth position, Jumbos’ sophomore Salik Awan prevailed from a 1–1 tie to defeat Polar Bears’ first-year Ishaan George with scores of 11–7, 9–11, 11–6 and 12–10. Tufts also won two of the last three matches in the fourth and seventh positions. Despite his loss earlier in the match, Dewire beat out Bowdoin first-year Carson Claar 3–1. Similarly, Raskopf won 3–1 in the seventh position to end the match on a high note. By the end of the weekend, the Jumbos received the coveted No. 24 national CSA rank with the absence of their first position player. Tufts will next compete in the 2019 CSA Individual National Championship in Providence, R.I. from March 1–3.